Margaret K. McElderry Books, 9781534404373, 320pp. We Were Liars meets Goodbye Days in this thrilling debut novel that sweeps readers away as they try to solve the mystery of what happened then to make Ellory so broken now. Then: They were four—Bex, Jenni, Ellory, Ret. (Venus. Earth. Moon. Sun.) Electric, headstrong young women; Ellory’s whole solar system. Now: Ellory is alone, her once inseparable group of friends torn apart by secrets, deception, and a shocking incident that changed their lives forever. Then: Lazy summer days. A party. A beautiful boy. Ellory met Matthias and fell into the beginning of a spectacular, bright love. Now: Ellory returns to Pine Brook to navigate senior year after a two-month suspension and summer away—no boyfriend, no friends. No going back. Tormented by some and sought out by others, troubled by a mysterious note-writer who won’t let Ellory forget, and consumed by guilt over her not entirely innocent role in everything and everyone she’s lost, Ellory finds that even in the present, the past is everywhere. Kit Frick is a novelist, poet, and MacDowell Colony fellow. Originally from Pittsburgh, Pennsylvania, she studied creative writing at Sarah Lawrence College and received her MFA from Syracuse University. When she isn’t putting complicated characters in impossible situations, Kit edits poetry and literary fiction for a small press, edits for private clients, and mentors emerging writers through Pitch Wars. 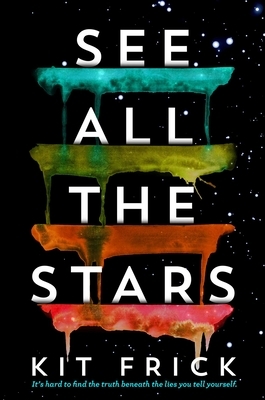 She is the author of See All the Stars and All Eyes on Us. Visit Kit online at KitFrick.com and on Twitter @KitFrick. "Complex, captivating, and gorgeously written, this suspenseful story of the lines that blur between friendship, love, and self-discovery demands to be read in one sitting." "Not many books surprise me anymore but this one gut punched me in the best way possible. Not only is this a page-turner, but it's also a beautifully weaved story on love, trust, and friendship, that's both relatable and heartfelt. A stunning debut!" "A gritty look at complicated friendships, sure to keep the reader guessing to the end." "Taut and riveting, Frick’s psychological thriller will keep readers on the edge of their seats." "A book to be devoured in one sitting....Frick's debut will especially be a treat for fans of E. Lockhart's We Were Liars."